Last edited by reel.deal on Mon Oct 01, 2012 11:34 am, edited 1 time in total. Interesting visual reminder of 7/7. Is it just me or does footage of riots normally show the victimization of police in order to make them seem like the less powerful force? That's all in order - no "advancing line of stormtroopers" here. Also, since it's not in the heart of the City of London, I guess they aren't perceived as a threat to the bankers? I can only speculate I guess, but why shouldn't Londoners be rioting? They live under one of the most oppressive Big Brother governments there is. I love the sequence from 1:31 to 1:39 in the video. Very Blade Runner-esque scenery with the smoke and the lighting. Well, more like the L.A. riots - without the killing. Last edited by reel.deal on Mon Oct 01, 2012 11:36 am, edited 1 time in total. 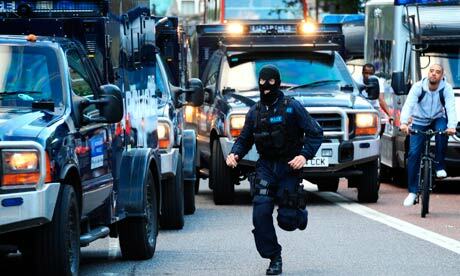 reel.deal wrote: Scotland Yard: 225 arrested. 36 charged. Still time for that 3rd 9 to come out of somewhere for an "inverted" 666. Why is everything burning so brightly in almost every fire picture (I mean burning almost completely white)? Nice catch, photographer! You beat some helluva odds to catch that stick so sharply mid-air. In the south London neighborhood of Brixton — the scene of riots in the 1980s and 1990s — youths smashed windows, attacked a police car, set fire to garbage bins and stole video games, sportswear and other goods from stores on Sunday night. But oooooooh, the guns of Brixton! The greatest-ever rock/reggae song, by The Clash, with one of Paul Simonon's only lead vocals. PLAY IT LOUD!!!!!!!!! The actual headline reads: UK Riots Spread to Birmingham, London Chaos No End‬‏ In Sight-Marx Proletariat Revolution 1-2 Seriously? I just saw a couple dozen cops, a handful of people walking around aimlessly and a couple of fake buildings going up in flames. Perhaps the revolution is ONLY being televised. Cops on exercise again without informing the public? Warm-up for the Nazi Games maybe! Something doesn't look right here...like the riots for instance! Oh yes the police injuries and undermanning blah blah! The guy is only in a hurry else he will miss out on his overtime! 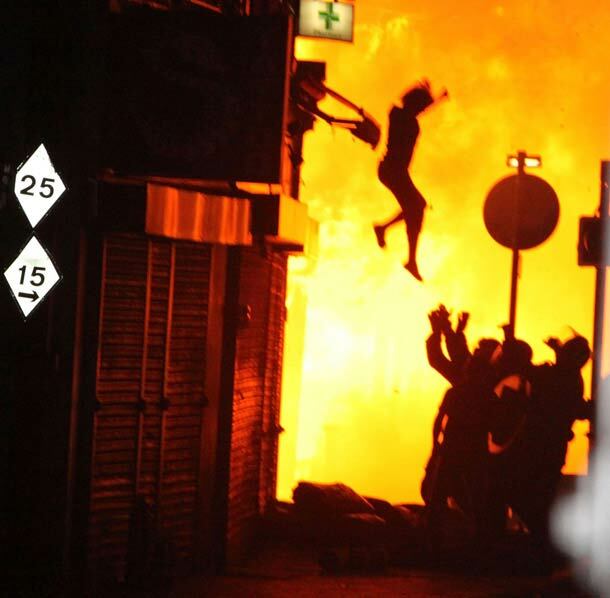 This is, at the moment, the symbolic picture of the London riots: a woman jumps from a building, firemen below opening their arms to catch her. On the background, the fire started by the rioters. The photo was broadcasted by Reuters, that later specified to have taken it from Twitter. The author is unknown and on the web there are doubts on the very authenticity of this shot. On the social networks some can recognize the street: supposedly Surrey Street in the Theatreland area. But there are those who suspect this is a skillful retouching job made with Photoshop. I certainly did not expect corriere.it to mention fakery. Is this because they are going to blame the fakery on the 'rioters', because the media would never ever fake anything...? Of course, if you control the 'rioters' too, it gets easier to blame them for anything.